What’s most striking about this poster is just how serious it is. The whole drunk super-hero thing is just substituted by a very serious Will Smith. As a matter of fact he is so serious he seems to be causing a lightning storm and a hurricane. Which he probably should be saving people from if he wasn’t so busy being serious. I wonder if they thought the humor just wouldn’t translate and so went with a straight sell. Seems like a weird decision. 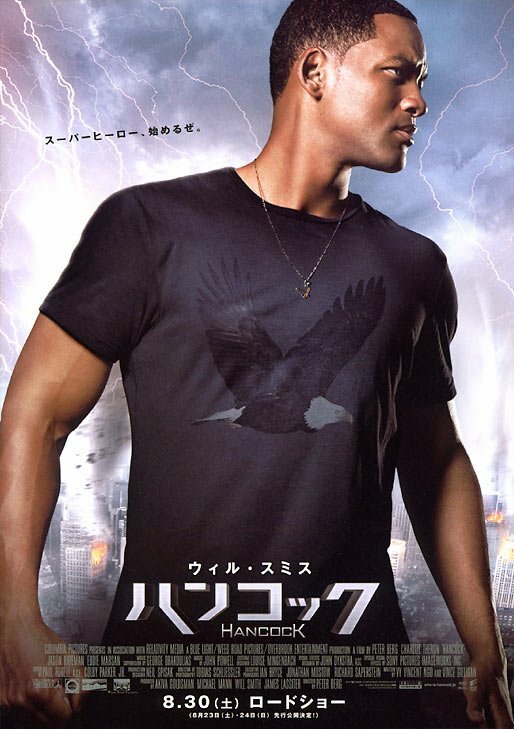 I just looked at the Swedish Hancock poster and saw that in his shades the silhouette of Stockholm is reflected. Is it a different image refleceted for every country? Hmmm, good question Susanne. I actually have no idea, but I’ll try to find out.